It’s been a while, but they’re back in style. We’ve been following the story of Steamship series since it got started. The brainchild of Michael O’Leary (Rick Bauer #5) it features a cast almost exclusively drawn from Guiding Light and As the World Turns. It is also the origin of DAF-fy (Disturbingly Avid Fan). It was originally posted on YouTube, but sadly was since pulled. The good news is that was done as part of a distribution deal prep. Steamship is pulling back into port. As I find out stuff, you’ll find out stuff. Like about any on-line soap fan, I’ve heard a lot about The Bay (with its cornucopia of soap stars) and I even follow it on Twitter, but I hadn’t bothered to watch any. Until now. Now, they’ve had a cross over with Steamboat. I watched it the minute it finished loading on Blip TV. Michael Donovan (Michael O’Leary, formerly known as Rick Bauer) comes across one of the stars of The Bay sleeping on a park bench. He is promptly recognized….. as Tom Hanks. Another terrific, plowing through the waves performance. Go Boat! I also want to say excellent opening credits for The Bay. Better credits than some of the broadcast soaps are currently using. Michael O’Leary has a writing credit also. Watch for the DAF-fy reference. We here at GLManny in honor of Michael O’Leary’s birthday today we award him our newly invented (because I just thought of it) the Robert Fulton Award for Steamboat, the series too funny for the Daytime Emmys. 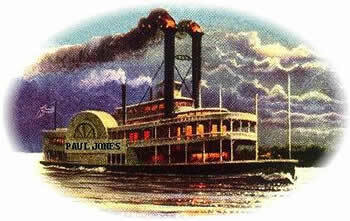 Fulton is described in The Reader’s Companion to American History this way: “Fulton did not invent the steamboat, but he designed and built the first commercially successful one. His genius lay in putting the ideas of others to practical use.” As O’Leary did not invent the web soap, but created one that took them to new places and hopefully will be commercially successful, GLManny feels it’s an appropriate award. Congratulations and Happy Birthday Michael O’Leary! Steamboat the show too funny for the Daytime Emmys. 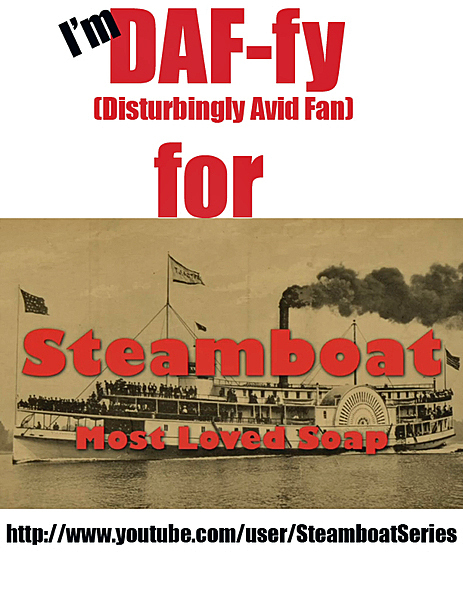 You might be DAF-fy (Disturbingly Avid Fan) about Steamboat if…. 1. you dream of brownies. 3. you ask the person behind the counter at drug store if they carry Lactene because you want your hair to be milky, not silky. 4. you find yourself rapping along with White Junk. 5. you spend time scouring the map for Vegeteria. 6. you find it absolutely necessary to call all your friends in the middle of the night and wake them up when you hear even the slightest rumor that a new episode will be released. 8. you plan to attend self defense classes on the proper use of an eyebrow pencil as a weapon. 9. you get a call from a Steamboat cast member as a prize for helping spread word about the show. 10. AND most telling you put together a list of the top 10 ways to tell if you’re DAF-fy about Steamboat. What are yours? This morning the @SteamboatSeries Twitter account tweeted that their bid to enter themselves in the new Webseries category. Sadly they were planning a West Coast fan event to coincide with the Emmys. Are You DAF-fy for Steamboat? If you already are DAF-fy for Steamboat, check out these great images now. Thank you to @Wolfefan for making these great posters. UPDATE March 26, 2016: Sadly while all the episodes were available on YouTube they were pulled down in 2012 as they looked for paid outlets. Apparently it was available through Amazon for awhile, but that no longer seems to be the case. I’m sorry and I hope it will be available again soon. I added the headings, a link to the preview video, and my current signature block. Every Friday I post another term of soap opera jargon. Disturbingly Avid Fan – Normally the exact origin of a particular term of soap opera jargon is hard to trace down, but this time we know exactly where it came from. The second season of behind the scenes soap opera spoof Steamboat introduced the character of Larry Trout who is described as an “Disturbingly Avid Fan.” This immediately struck a chord with viewers who self-identified on Twitter immediately as Disturbingly Avid Fans. While the Trout character clearly is the type to have a collection of restraining orders, most self-identified fans just mean really devoted, big fans of a show. It has quickly spread through the online soap fandom. See the introduction of this term in the identifying phrase under Larry Trout’s name in the clip below.